Fredrick Wanyama is Deputy Vice-Chancellor, Academic and Student Affairs at Kisii University, Kenya, and Associate Professor of Political Science at Maseno University in Kenya, where he earned his PhD in political science. He is also a researcher on ESID’s project, The political economy of social protection expansion in Africa. 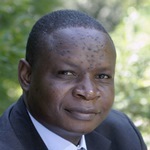 Professor Wanyama’s research interests include the politics of development and democratisation in Africa, and politics and social protection in Kenya. Wanyama, F. and McCord, A. (2017). ‘The politics of scaling up social protection in Kenya‘. ESID Working Paper No. 87. Manchester. Wanyama, F. and Elklit, J. (2018). ‘Electoral violence during party primaries in Kenya’, Democratization, 25(6): 1016-1032. Wanyama, F. O. (2014). Cooperatives and the Sustainable Development Goals: A Contribution to the Post-2015 Development Debate. Geneva: ILO. Wanyama, F. O. , Elklit, J., Fredericksen, B. F. and Kaarsholm, P. (2014). ‘Ethnicity and/or issues? The 2013 general elections in Western Kenya’, Journal of African Elections, 13(2): 169-195. Wanyama, F. O. (2013). ‘Political leadership and development in Kenya, Uganda and Tanzania’, in M. N. Amutabi and S. W. Nasong’o (eds. ), Regime Change and Succession Politics in Africa: Five Decades of Misrule. New York: Routledge, pp. 17-47. Read Professor Wanyama’s Maseno University staff profile.